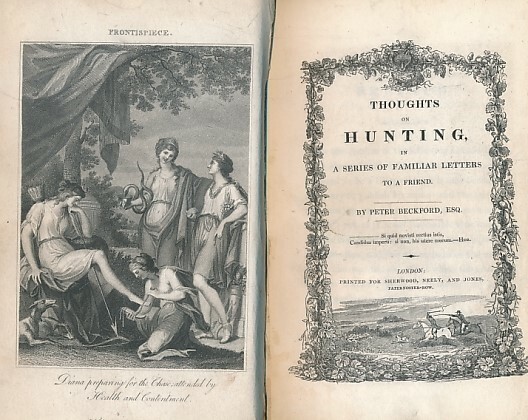 Barter Books : Beckford, Peter : Thoughts on Hunting in a Series of Familiar Letters to a Friend. Engraved frontispiece of Diana and one fold-out engraving of kennel plan/elevation. Several wood cut engravings within text. 240 x 150 mm (9 x 6 inches) - xii, 321pp. G: in Good condition without dust jacket as issued. Leather worn along spine hinges. Wear to leather at head of spine and lacking leather title panel. Marbled endpapers.